If a business wants to look professional, it needs professionals to keep everything pristine. 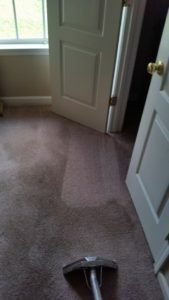 This is where commercial carpet cleaning services come in. 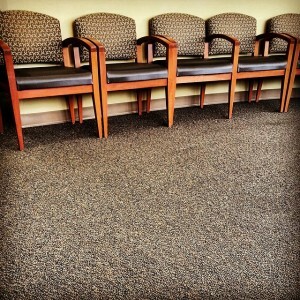 Clean floors create a pleasant environment for employees, visitors and customers. Properly maintained carpets not only look great and last longer, they also contribute to a healthier environment by reducing the potential for Indoor Air Quality issues. In most cases, when a residential service is called out to a property, it’s a one-time thing. The workers get in, take care of the floors that need help and head out. 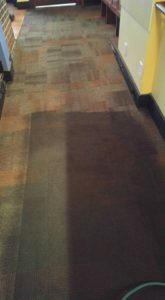 There’s a little more to it with a commercial carpet cleaning service, as these businesses focus on maintenance. Facilities spend millions of dollars on carpeting, upholstery, leather and oriental/area rugs as part of their overall image. 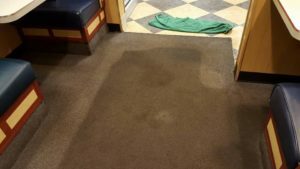 Poor maintenance can adversely affect your professional image, waste thousands of dollars in misdirected cleaning costs and reduce the performance and life of your carpet. Every workplace has high-traffic areas that take on the brunt of the dirt. That’s why we offer an interim carpet cleaning service. By addressing these areas, we can provide better carpet protection, extend the life of your carpet and make regular cleaning faster and easier. Many offices, retail establishments and other commercial areas count on us to provide solutions to their carpet cleaning needs. Once a detailed layout of the building is put together and the points of concern are flagged, the maintenance can begin. • Our employees are trained in the most modern and effective office and industrial cleaning techniques and are also trained in product usage and safety procedures. • All traffic areas are pre-conditioned to loosen deeply embedded soil so that the powerful steam-cleaning process lifts even the tiniest particles from the base of the carpet fibers. • Using the finest equipment available, your carpets are thoroughly steam-cleaned with a powerful truck-mounted carpet cleaning unit that will leave your office carpet looking like new. • In the event of an emergency, we can be reached by phone 24/7. To really figure out the best way to keep your space clean, we’ll need to take the time to get to know it.